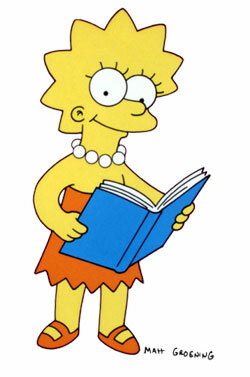 Bart Simpson’s sister, Lisa, is usually cast as the ‘liberal’ conscience. This particular show was no exception. Whether one likes it or not, The Simpsons is one of the most popular cartoons in television history. It has come	to have a prime place in the homes of so many people every week (and every night with the seemingly endless reruns).1 Therefore, it has become a reflection of American, and wider western, culture, and a	good gauge of the social issues currently in the public mindset. In the episode ‘The Monkey Suit’, which aired in Australia on Tuesday 5 September (and months ago in the US),	The Simpsons addressed teaching creation vs evolution in US public schools in its usual highly satirical manner.And	unsurprisingly, it was biblical creation that received the heavier ridicule. This is not the first time something resembling biblical creation has been satirized on The Simpsons. In an episode	that aired in the 13th season called ‘Gump Roast’, two aliens named ‘Kang’ and ‘Kodos’	said they had seen Earth created ‘5000 years ago, by God.’ However, ‘The Monkey Suit’ was the first	episode to deal with creation and evolution at length. The case against evolution is finally dropped after Homer ‘goes ape’ over a beer bottle and Ned admits Homer	could be related to apes. While at the town museum, Ned Flanders (an ‘over-zealous’ evangelical Christian) sees an evolution exhibit. He	then leaves horrified to hear that humans supposedly evolved from monkeys, covers his children’s eyes and promptly	exits the museum. Ned meets up with the Church council afterwards, and they decide to blackmail the local elementary school	to teach creation as opposed to evolution. They even convene a town council, where evolution is summarily outlawed from	being taught. Even though its intent is to mock, The Simpsons gets this spot on! The whole problem is not about ‘intelligent	design’. The problem is that evolution goes directly against the Word of God!Evolution is therefore based on	a wrong understanding of science itself. It is not just based on the idea that everything observed to happen in the universe	is a process that can be explained naturally; it also says that the origin of everything observed in the universe	must have a purely natural cause. The personal God of the Bible making things from nothing by his Word is not a natural	explanation! Lisa is then brought before the court in a case titled ‘Lisa Simpson vs God’ that is itself a parody of the famous	Scopes trial. The attorneys hired for the trial are named ‘Clarice Drummond’ and ‘Wallace Brady’,	directly parodying both the actual trial lawyers (Clarence Darrow and William Jennings Bryan) and their namesakes in the	play Inherit the Wind (Henry Drummond and Matthew Harrison	Brady). The case against evolution is finally dropped after Homer ‘goes ape’ over a beer bottle and Ned admits	Homer could be related to apes. The old canards are brought out, like the idea that ‘Christian’ and ‘scientist’ are a contradiction	in terms (the Creationist ‘expert’ has a bogus degree ‘in Truthology’ from a Christian diploma mill). Christians are also portrayed as having a secret agenda in proclaiming the Bible as truth. It’s all about the numbers	in the pews, apparently. While Lisa is being arrested, the local criminal, ‘Snake’, is shooting people from the top of the convenience	store saying: ‘You live! You die (then shoots)!’ This is supposed to present the idea that Snake’s	actions are far more important to deal with than the creation/evolution issue. The irony is that Snake’s arbitrary	killing spree is in fact a perfect logical conclusion from the premise that evolution is true. If humans are nothing but	modified pond scum, then ultimately there is no reason to value human life as anything more than a means to a pointless	end. The story ends with Ned and Lisa coming to some sort of agreement that ‘religion and science should never mix’.This	is unfortunately a compromise much of the church is happy to make for the sake of peace. The problem is that religion forms	the basis for all understandings of origins.Evolutionists base it on principles that place fallible man as a higher	authority than the Bible, whereas biblical creation is formed on the infallible Word of God as the final authority on everything	it touches upon. This episode obviously has its negative points. Once again, biblical creation is ridiculed in the popular media with blazing	strawmen lighting the screens. It’s also unfortunate that that is a good estimation of public opinion of not only	creationists, but the Bible as well.It presents creationists as irrationally fanatical or promoting creation for less	than upright reasons. We need to bear in mind what sort of effect these images will have on our children.But the mere	fact that such a fuss is made in something like The Simpsons is great reason for those who trust in the Word of	God as the ultimate authority to take heart. We are making an impact—a show such as The Simpsons would not	take any notice of us if we weren’t. A poll taken in Chicago found that while one in four people surveyed could name one of the five freedoms guaranteed by the first amendment to the American Bill of Rights, more than half could name at least two members of the Simpson family. See http://www.msnbc.msn.com/id/11611015. Return to text. I.e. with all of its scientific problems, and philosophical/religious presuppositions, on show. The problem is often thought of as religion being taught in the science classroom. But the problem is not whether religion is taught in science; it’s which religion is taught in schools: naturalism or biblical Christianity. Religion is always taught in schools. However, the religion of naturalism, which evolution is based on, is the dominant religion of the western world today, and its educational systems. Return to text.